I can’t believe it’s nearly Christmas! 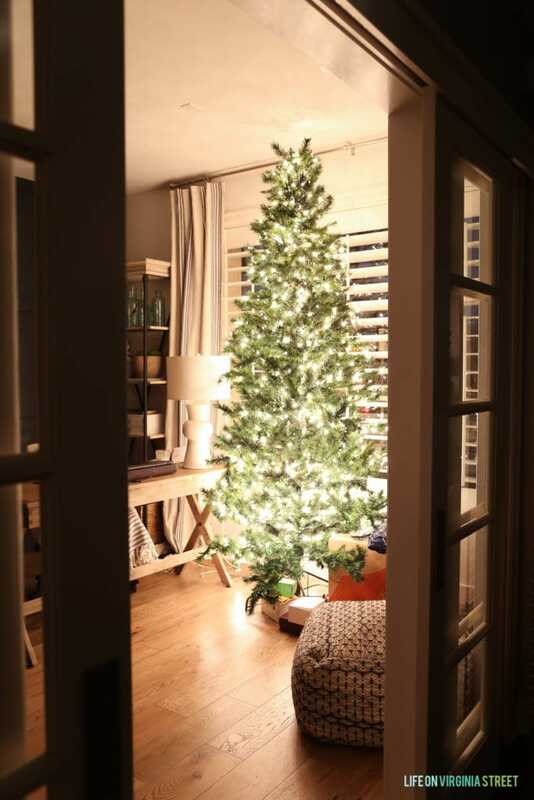 Today I’m sharing one of my favorite home tours of the entire year – our home lit up only by Christmas lights. 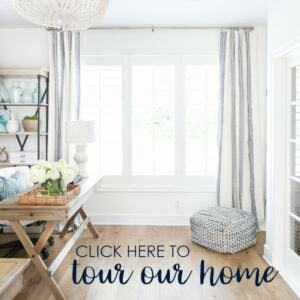 I’ve teamed up with my friend Rachel at Maison de Pax, along with 25+ other bloggers to share what I consider to be some of the most beautiful home tours. If you’re stopping in from A Burst of Beautiful, welcome! 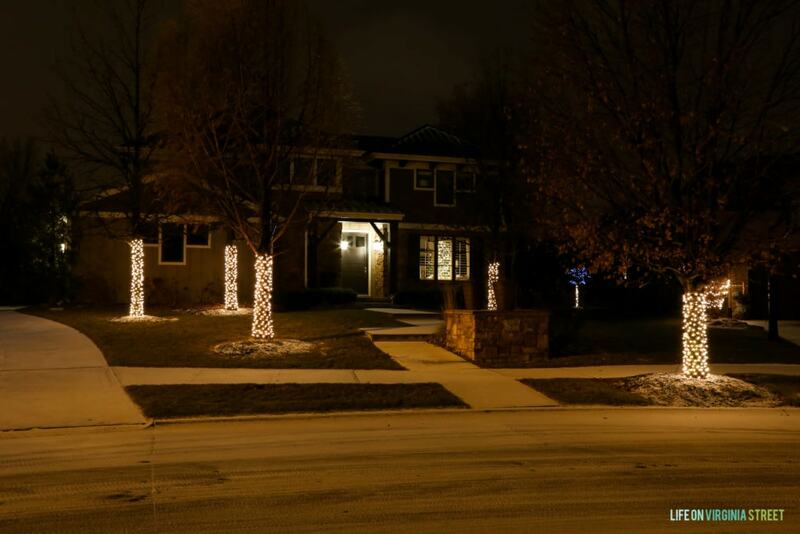 There is very little more magical than the glow of a home lit by Christmas lights! As the year draws to a close, I want to thank each and every one of you for reading my blog throughout the year(s). I hope you all have a very Merry Christmas! I’ll try to keep the words to a minimum on this post and leave you mostly with the images. I’ll probably pop in once or twice next week, but until then, I want to wish you all a peaceful and happy Christmas! I hope you enjoy this tour! Our neighborhood has a tradition where we all wrap our trees in our parkway with white lights. It looks so beautiful that we decided to wrap all the other trees in our front yard as well this year! Bonus – we actually got some snow last night. And by some I mean just enough to barely cover the sidewalk, but we’ll take it! I kept our Christmas decor very simply this year. I really tried to avoid anything that felt like clutter. 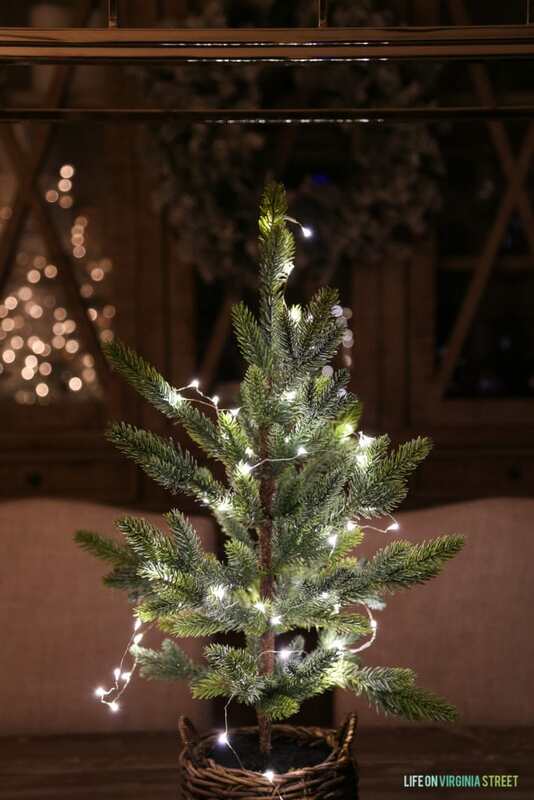 The Christmas lights are so beautiful on their own, I really tried to let them take center stage! I added our big Christmas tree to the office as I have in years past, but this year, I didn’t decorate it. 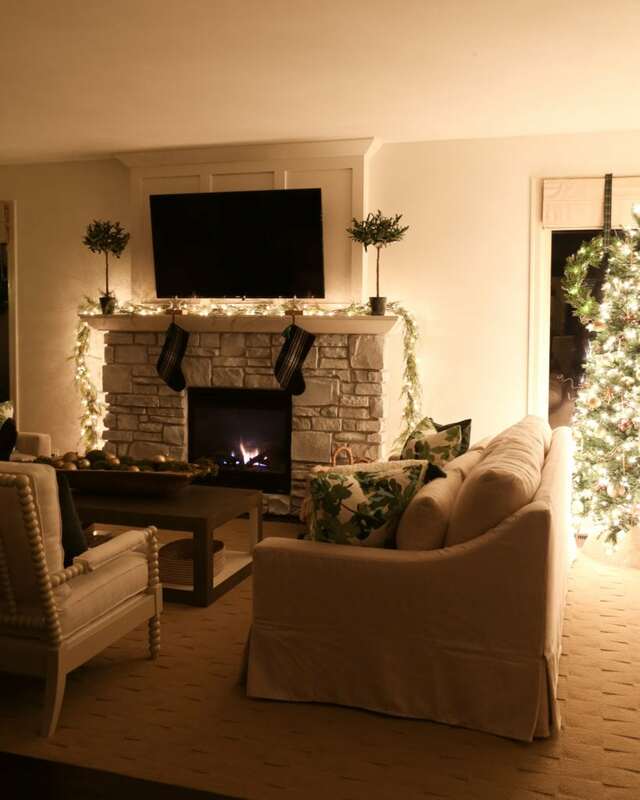 Which is why you never saw this room in any of my Christmas home tours this year. If you missed them, you can check our living room & dining room, guest bedroom & entryway, and master bedroom & craft room during daylight hours. I actually love the bare tree in the office. The glow means we never have to turn on overhead lighting! And it makes for a pretty view from the street as well. The cord never got put away properly in our dining room. But all I can focus on is how beautifully the flocked tree glows at night! 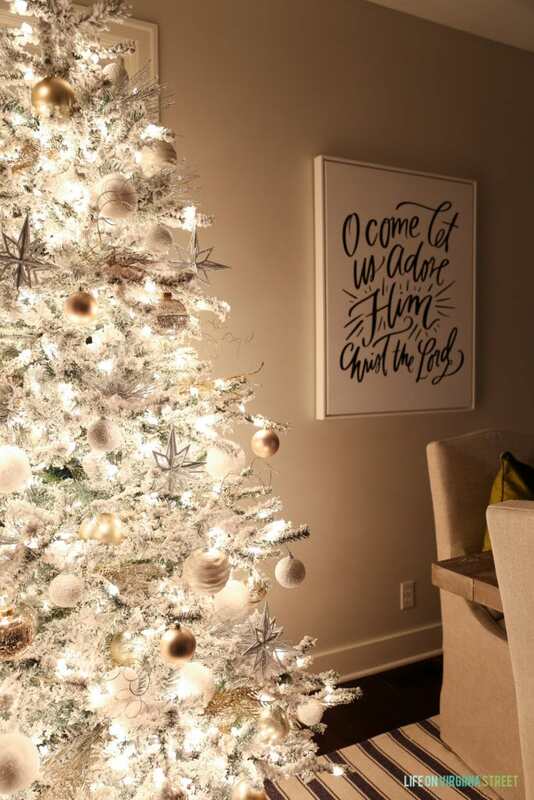 The ‘O Come Let Us Adore Him’ canvas is a favorite and it looks equally as beautiful at night! We love nothing more at Christmas time than to curl up on our sofas, turn the fire on, and binge watch TV together. There’s something so great about being lazy when it’s cold outside! It’s a pretty magical view when standing in the kitchen each night! The surrounding windows just add to the sparkle and glow! I hope you enjoyed this tour! The next stop is Kelly Elko. Be sure to swing by to tour her home as well! I’ve also linked to all of the other homes on the tour below. Have a very Merry Christmas! Thank you so much! And that is actually inset carpet our builder added so unfortunately I don’t have any info on it. Sorry! 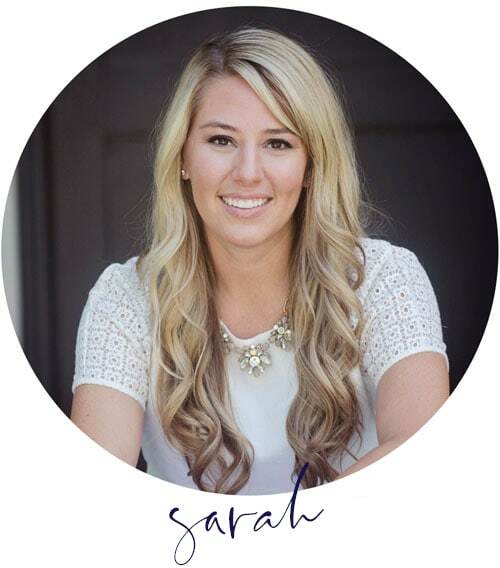 Sarah- your home is so beautiful lit up at night! 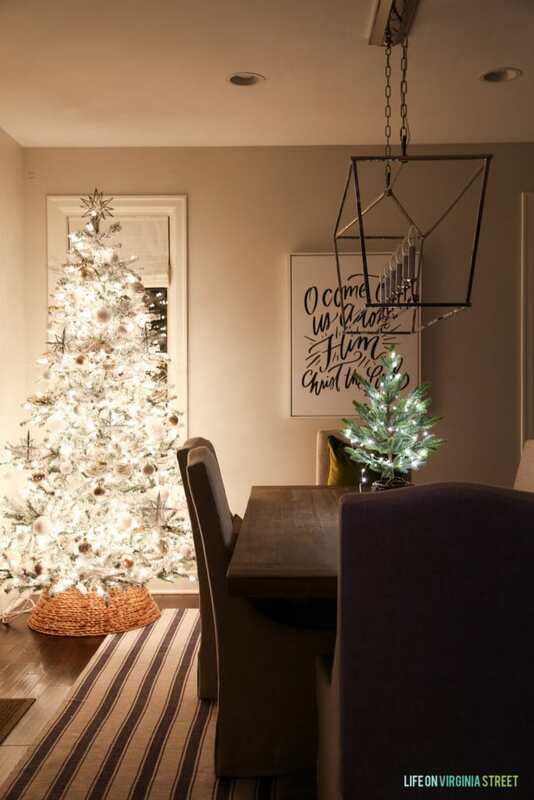 I love the tree in the dining room too. Thank you so much for joining the tour! Gorgeous as always! 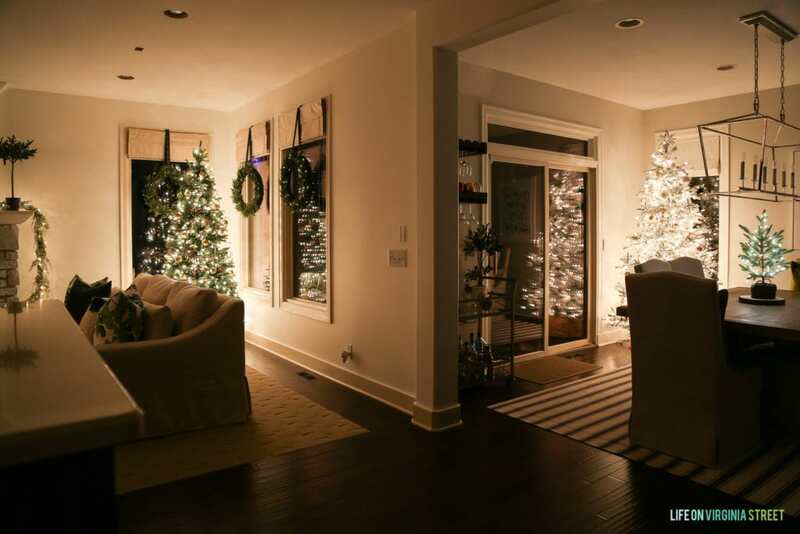 Where do you run the power cord for the lights wrapped around the trees? Thank you! And our cords are super classy. They’re just running on our grass. We use green cords to they’re a little less noticeable. Typically we have real snow by now so it’s usually not an issue. For the ones in the parkway we have to run it in between the seam on the sidewalk and then we secure it with silver duct tape. Again not super classy but we don’t know any other way to do it! Love your neighborhood tradition of wrapping the trees! 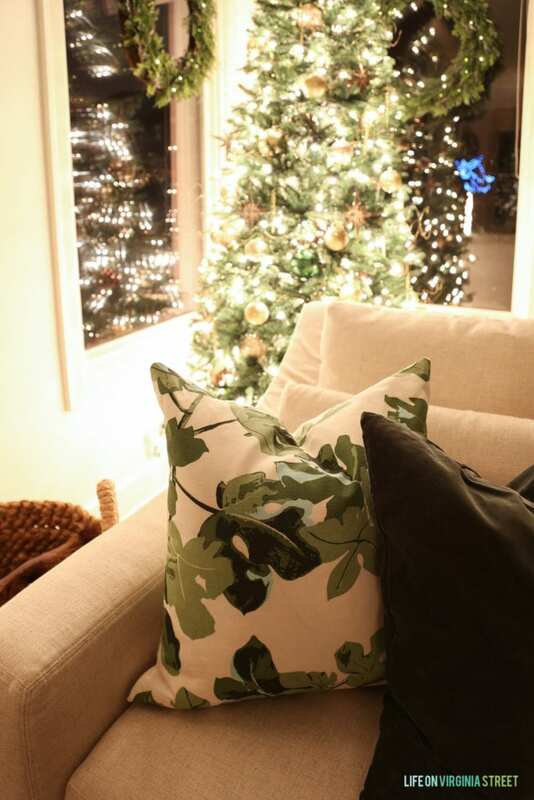 Your home is stunning – Merry Christmas! Your home is always so beautiful. I love your trees! Hope that you have a Merry Christmas!